WASHINGTON (Reuters) - President Barack Obama, who has portrayed himself as surprised by technical problems with the government's new health care website, was briefed last spring on a detailed consultant's report that warned of system failure, White House spokesman Jay Carney said on Tuesday. Carney said the president's familiarity with the report and recommendations by McKinsey & Co did not contradict previous statements from the White House that described Obama as surprised by the scope of flaws in HealthCare.gov since it opened for people to enroll for insurance coverage on October 1. Obama was told the problems identified by McKinsey were being addressed, Carney said. 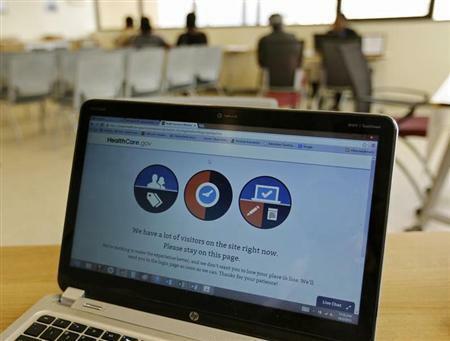 After reeling from technical problems at its website for more than six weeks, the Obama administration on Tuesday also said that it is still months away from completing the back end of the system, including functions needed to finalize federal subsidies for consumers who buy health plans. Administration officials said the complicated information technology system's financial management function would not be completed until mid-January, weeks after the first enrollees are scheduled to begin receiving benefits under the Affordable Care Act, passed in 2010 as Obama's signature domestic policy. Julie Bataille, a spokeswoman for the U.S. Centers for Medicare and Medicaid Services (CMS), played down the January timeframe, saying the financial management functions are not among the high priority fixes aimed at ensuring a smooth operation for consumers to shop, enroll in coverage and make their first month's premium payment. But the ability of the administration to deliver federal premium tax credits as partial premium payments for qualifying consumers is a vital segment of the function of the new online marketplace. Also not due until January are functions involving risk adjustments for insurers and the monthly reconciliation of enrollment data. The McKinsey report, released Monday night by a Republican-controlled House of Representatives committee, is the most detailed analysis made public to date of the difficulties the site was facing late in its development. It warned the government of the potential for system failure that could make the health care exchanges inaccessible to consumers trying to buy insurance through them, suggesting that there was not enough time before October to make all the repairs. Release of the report by the Republican chairman of the House Energy and Commerce Committee was part of a broad effort by Republicans to discredit the health care program and to portray the Obama administration as incompetent in implementing the health care law. Democrats are increasingly joining the chorus of criticism. Representative Elijah Cummings, a senior Democrat and ally of Obama, called on Tuesday for a White House shakeup over the handling of the rollout of the healthcare law, commonly called Obamacare. The website is an online exchange that allows consumers to shop for coverage under the law, which mandated that Americans have health insurance and created new marketplaces to buy and sell policies. In a separate House hearing, Republicans portrayed the website as not only broken but not secure for personal information of consumers. Three security experts testified that HealthCare.gov was so insecure for consumers that they believed it should be shut down until fixed. Obama administration officials responded that the site was safe.